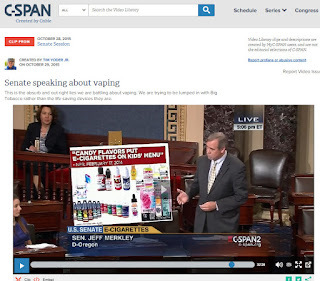 I am sitting at my computer listening to you, as members of the United States Senate, discuss the proposed FDA deeming action in regards to e-cigarettes. However, you are either willfully misrepresenting the data available, or are terribly, terribly misinformed. Yes, you read it right; You're either lying or have been fooled. Would you like to know how? If so, read on. If not - if you want to continue wallowing in dishonest ignorance - stop reading right now. For starters, the vast majority of vapor products are not being manufactured by Big Tobacco. Most vapers have worked to distance themselves from the the very idea of tobacco. We call our devices mods, not e-cigarettes. We use e-liquids, not tobacco. We produce vapor, not smoke. In fact, the Big Tobacco companies you are so certain are targeting youth with tobacco products are likely the only products that will be allowed on the market if the grandfather date is not moved forward. You are protecting the very companies you are vilifying. The poster used to illustrate this featured a headline from more than a year ago and many flavors and logos no longer on the market or advertised in the same way. 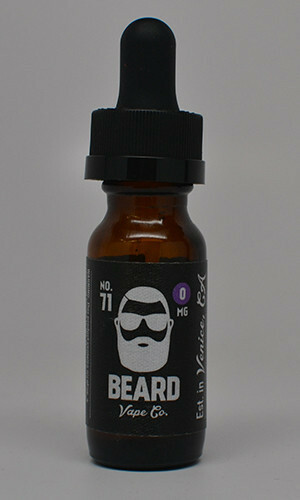 Many e-liquid companies have voluntarily altered their logos and e-liquid names to ease fears of targeted advertising. Altered logos aside, the e-liquids do contain a lot of different flavors. However, they are not directed at children. Instead, they are directed at adults who, for the first time in a long, long time can taste things again having given up tobacco. I ask each and every one of you what you had for lunch... dinner last night... what is in your pantry... are you eating flavorless foods? Do you exist on unsalted rice cakes? Somehow, I doubt it. Further, most shops voluntarily posted "no admittance under 18" signs. Most websites require verification to enter. The vast majority of vapers I know are in favor of restricting access to vapor products to adults over the age of 18. These are primarily grass-roots actions taken to demonstrate our willingness to work alongside a system that claims it wants to help people. They are also actions taken to protect the products and devices that we know have helped us and can help many more. Which cartoon fruity flavor is this? Cartoon images and names were also mentioned. I have no experience with Scooby-Doo e-liquid (although it might exist), yet, as I flipped through an issue of Vape magazine, I saw very few examples of cartoon imagery being used to entice younger readers. But, even if it were cartoon imagery, to assume that adults do not like cartoons flies in the face of the popularity or programs like The Family Guy, The Simpsons, King of the Hill, Archer, and many other prime time and cable animated programs. Even when those programs were not being aired, I really enjoyed - as an adult - sitting down with a big bowl of cereal with my children and watching Saturday morning cartoons. Even then, aside from Popeye's pipe and the "bad wolves," I never saw cartoons being used to promote smoking. I will admit that I have recently seen a very, very old cartoon of the Flintstones used in a cigarette commercial. After more than 30 years smoking cigarettes - I started by trying one to be cool, moved on to pilfering Camels and Pall Malls from my parents before I came of age and could buy my own - I quit. Once I had children of my own, I wanted to stop. And, I tried. I tried over and over again. Patches, gums, lozenges, pills, cold turkey. None of those methods worked for me. I always returned to smoking. Last year, as I sat at the side of my father's hospital bed while he waited for yet another pointless test to be run to see if there was something, anything, that could prolong his life, he told me that I needed to "quit those damn cigarettes before they killed you, too." My father passed away and cigarettes - COPD and small cell lung cancer - was the cause. Less than 30 days after that, I quit smoking with the help of a personal vaporizer and a coffee flavored e-liquid. I have not had a cigarette in 340 days. 341 days ago, I tried one and found it so foul tasting that I never wanted another one. I never wanted to taste anything tobacco again. I gave kits to my mother, my son, my stepson, my stepdaughter. I am happy to say that my stepson has quit smoking and vaping. He is done with it altogether. My stepdaughter has quit smoking and has steadily been reducing the nicotine content of her e-liquid. My mother has cut way back and, although I am not living near enough to confirm this, she tells me she has not purchased a cigarette since she last purchased a carton of cigarettes in May. My son tells me he's done with cigarettes, now that he has a kit. As I write this, I am enjoying a vape. The e-liquid in my device - my personal vaporizer - contains no nicotine. No nicotine, yet is still satisfies that hand to mouth, inhale habit. A lot of research has been conducted over the past six years. I'm sure that the FDA was taking its time awaiting the results instead of blindly stumbling forward and potentially destroying what might be our best hope for ending the plague that is tobacco. Some of that research indicates that the products you are protecting - those that existed before the grandfather date and those currently manufactured by Big Tobacco - fail to help smokers quit smoking. The products you want banned - those developed since the grandfather date - have a nearly 68% success rate in helping people quit smoking. By eliminating devices that help people quit smoking, aren't you just encouraging people to continue smoking? And vaping is NOT as dangerous as tobacco. Public Health England recently released a report stating that vaping was 95% better than smoking, and 40% less expensive. Perhaps that is the goal. After all, it was reported that Massachusetts has diverted nearly 99% of it's tobacco settlement funds to anything but preventing smoking. And it's no secret that California has received about $12,654,948,077.12 in tobacco settlement funds between 1999 and 2014 and fewer smokers means less money. It was also reported that states have collected around $244 BILLION in tobacco settlement funds between 1998 and 2010, but in that same time spent only $8.1 BILLION in tobacco prevention programs. Unless my math is way off, that's $235.9 BILLION NOT being spent on tobacco prevention. I further note that each of you have significant campaign contributions from the health / pharmaceutical industries. The very same industries that are no longer making money selling products that are not as effective in help people quit smoking. The same industries that make a lot of money treating people with cancer and emphysema and COPD. There was a fundamental flaw and a lot of assumption in a prime piece of data that was presented over an over. While it may be true that the number of youth that have tried e-cigarettes may have tripled, what was not presented was how many continued using them on a regular basis. Further, there was no data presented regarding how many youths were smoking in comparison to, or were using vaping products to quit smoking. Using similar logic used in this particular argument, it might be said that 72% of high school students were alcoholics. It would appear to me that your methods are flawed and your data incomplete. Yet you continue to use this pile of debunked rhetoric in a short-sighted attempt to prevent people from having access to what is arguably the best stop smoking aid short of dying. While telling the public that flavors are the enemy and are being used to lure children to e-cigarettes - which have been proven over and over again to be a magnitude better than combustible tobacco - you ignore the benefits. I know that I can sleep soundly tonight because I have followed my father's wishes: I have quit smoking, and I have helped others do the same. Can you tell me, honestly, that you'll be able to rest with a clean conscience while trying to deliver over an entire population, and a budding industry, in to the hands of Big Tobacco on the basis of a couple flawed reports and a hatred of flavors? Thanks for this writing. Clearly these are the opinions one derives from a genuine interest in protecting public health. Great words. The deeming regulations will set the grandfather date to 2007. The devices that will be left available to the vape community will be the Mark Ten e-cigarette, the Vuze e-cigarette and the Blu e-cigarette. Mark Ten is manufactured by Altria (Marlboro), the Vuze is manufactured by RJ Reynolds (Camel) and the Blue is manufactured by Lorillard (Newport). These ARE big tobacco companies.